There has been a fairly prevalent belief in the ceramics world that cone 6 electric ceramic glazes are boring. But these days, that myth is being dispelled as more and more artists glaze fire their work to cone 6. To get great cone 6 pottery glaze surfaces, you just need some good glaze recipes and firing tricks. Jonathan Kaplan figured out how to tweak his cone 6 glazes and his kiln firing schedule to add some “oomph” to his electric-kiln-fired ceramic surfaces. Today, he shares his techniques for enlivening cone 6 glazes and some of his favorite Cone 6 ceramic glaze recipes. – Jennifer Poellot Harnetty, editor. Color and texture in cone 6 glazes are the result of three variables: First, selecting proper glazes; second, learning how to layer and combine different glazes by pouring, dipping and spraying; and third, using a controlled cooling cycle that brings the ceramic kiln temperature down slowly to further enhance the color and texture. This slow cooling not only creates a visual dialog in thick and thin areas of glaze application, but also helps with the crystallization of certain materials, which adds depth and interest to the glaze. Learn to get the most out of electric kilns when you download this freebie, Techniques and Tips for Electric Kilns. Go Beyond the Owner’s Manual! This fourth edition of Electric Kiln Ceramics, has been completely rewritten, reorganized, and expanded by Frederick Bartolovic. Loaded with new color images that highlight some of the most beautiful results possible with electric firing, the new edition features step-by-step instruction on forming and finishing pieces for electric firing, kiln firing schedules for both manual and computerized kilns, and even glazing techniques and recipes to try out in your electric kiln. Learn more and download an excerpt! I spray or dip glazes over each other. My experience is that no single glaze can provide a visually interesting surface in an electric kiln, although there may certainly be exceptions. My layering technique allows the many differing glaze materials to combine and melt in unique ways, providing a visually interesting surface with depth. All of this is caused by the interactions of multiple materials applied over each other. Applying glazes over textures in the clay allows the melted glaze to pool. A thicker concentration of glaze materials in these areas yields different areas of color. When mixing and testing glazes for future use on your pottery, it is useful to try different methods of combining glazes. For example, if you mix up a few small test batches of different glazes, try dipping one glaze over the other on the top rim of your test tile. Then reverse the order. For instance, if you dip glaze A over glaze B, then do another tile with glaze B dipped over glaze A.
I have found that this provides a better melt and allows a good mingling of the many layers of glaze. It’s necessary to experiment and test your glazes to determine their range. Kiln wash or stilts under your ware is a necessity! Disk Vase with Blue/Green/Purple variation of VC glaze with PV Black sprayed on top. 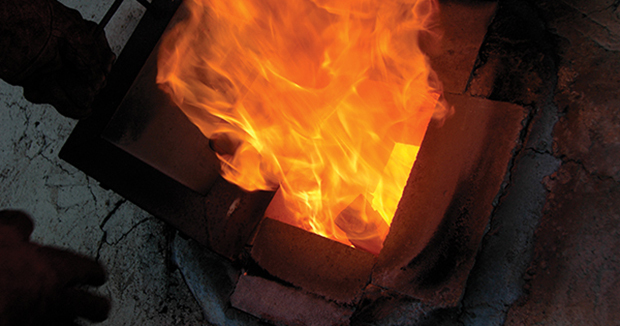 It is fine to program a “hold” into the end of the second segment if you have a single zone kiln and wish to try to even out the firing from top to bottom. With the introduction of multiple zone controls on many of the new kilns, a soak at the end is not really necessary. If you don’t have a computer-controlled kiln, use the infinite switches to “fire down” the kiln. With the addition of a pyrometer and a decent thermocouple, you can achieve a reasonable controlled cooling cycle. It’s important to keep accurate records so when you get results that are pleasing, you can repeat them. In an electric kiln, repeatable results are easier to achieve than in a fuel-burning kiln, especially if your electric kiln is equipped with a programmable controller. There is no substitute for experimenting. It takes time and persistence to achieve the surfaces that are pleasing to you. No one glaze or method will work. It is a combination of glazes and applications, followed by the proper firing schedule with a controlled cooling cycle. Add:, application, artists, ceramic, ceramic glaze, ceramic kiln, ceramic kiln temperature, ceramics, clay, color, combining, cone 6, cone 6 glazes, cone 6 pottery, dip glazes, dipping, download, electric firing, electric firing kiln, electric kiln, electric kiln ceramics, experience, firing, firing kiln, glaze, glaze fire, glaze recipes, glazes, glazing, glazing techniques, green glaze, how to, images, kiln, kiln ceramics, kiln fired, kiln firing, kiln firing schedule, kiln temperature, kiln wash, layers, learn, materials, mixing, pieces, pottery, pottery glaze, pouring, pyrometric cones, recipes, results, shares, spraying, surface, surfaces, technique, techniques, test tile, testing, texture, thermocouple, tile, time, vase, ware, wash. Plastic Vitrox. It’s a very white, plastic feldspar, but it can be used instead of kaolin in glazes. Use a lighter colored clay body, and apply it unusually thick. Thicker is redder, thinner is browner. Isn’t 2167 F cone 5??? How is this cone 7 in the firing schedule? i have been in pottery for many many years, but the last 20 years, I have been doing pottery as a second career and make mermaids and hand built plus throw pots almost daily. I am in 5 galleries and make my own glaze. I think I save at least 50% by mixing my own glazes but it is work. I took a class from a well known teacher Hesselback. He has written books and has made a software package that helps develop glazes. I use formulas that I have found on internet and try them. I love Val’s Turq, and Bright blue glazes. Hope this helps. I am just restarting ceramics after twenty years of firing glass. Can I use my glass kiln to fire clay? Hi Nancy, I see your comment was from 2012, so you have probably figured it out by now and did not need my comment. Oops. I am very new (as in never done)at mixing my own glazes. Is there are book that would tell me step by step how to mix my glaze. Also is it cheaper to mix my own? I am a enjoying making pottery as a hobby and giving my work on family and friends who very graciously accept it. Thanks for sharing these exciting recipes Jonathan! What could I use in the UK instead of Gerstley Borate? P.S. In that newly expanded Electric Kiln Firing freebie… What in the world type of clay was Jayne Shatz using to get the Ketchup Red to actually come out KETCHUP Red?! Wowzers! That blue/green/purple is lovely, thanks for sharing! 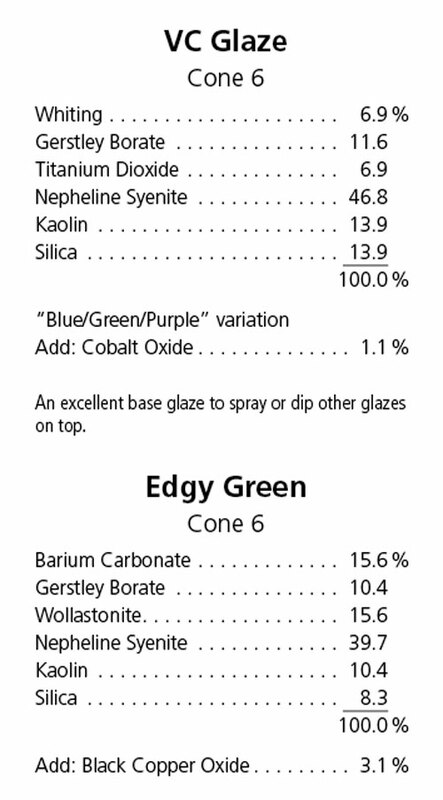 Quick question about the “Edgy Green” one though, with the 15.6% Barium Carb ingredient – is the glaze still dinnerware safe?